Mark Dearmon (third from right) accepts a check from family members to support the NC 4-H Performing Arts Endowment. When coworkers and friends gathered in January to celebrate Mark Dearmon’s retirement from NC State University, they were asked not to give him presents. Instead, Dearmon suggested they make donations to a new endowment he established at the university to support performing arts programs for 4-H’ers. Dearmon’s coworkers and friends have since contributed thousands of dollars to the endowment. 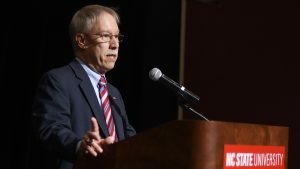 Dearmon, who began his nearly 40-year career at NC State as a cinematographer, retired as the director of operations and special projects for University Communications at the beginning of the year. As he prepared for retirement, Dearmon established the NC 4-H Performing Arts Endowment. When fully funded, the endowment initially will provide scholarships for 4-H’ers who are invited to perform at 4-H Congress, which brings together hundreds of youth representing all 100 North Carolina counties. As the endowment grows, it may also be used to support 4-H’ers performing at related events and for master’s classes at 4-H Congress. The ultimate goal is to support the NC 4-H Performing Arts program in perpetuity. Dearmon said he was not a “true 4-H’er” during his youth, but his history with the organization began in the ninth grade when an extension agent visited his science class and asked students to join a new 4-H photography club. After he came to work at NC State in the 1970s, Dearmon became involved with the 4-H Youth Development Program at the university. In 1982, he was part of a group that started the 4-H Performing Arts Troupe, which was made up of 4-H’ers from across the state who performed at 4-H Congress. Performers had only days to rehearse a 90 minute-long original musical. Performing arts programs had been run on a shoestring budget until a generous donor stepped up in the 1990s, according to Dearmon. However, stock market turmoil in 2008 forced the donor to pull support. “I was still managing that program, and I saw the impact that it had. We were losing ground,” Dearmon said. Creating a permanent funding source for performing arts is important to Dearmon because of the influence of 4-H programs on the state’s youth. “I look around at kids who came through my programs and see the success they’ve had. And many of them attribute it to their 4-H experiences in the performing arts, as well as a lot of other things,” he said. Anyone wishing to make a gift to the NC 4-H Performing Arts Endowment can do so here.